This one should've been simple enough to create. Just find some Rodents of Unusual Size and record them, right? We tried that—they ate our microphones! And sound samples from real-world rats weren't nearly monstrous enough for what we had imagined. The solution here was Australia's Tasmanian Devil, whose maniacal scream is part of how the animal got its name. Thanks Australia! 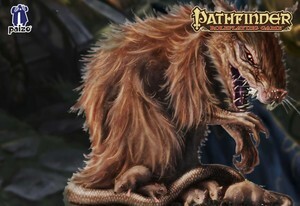 Giant Rats... vicious, hideous, angry and diseased!